A busy day today. We’ve not got much to show for the 20 man hours we’ve put in today, but we’ve overcome a lot of hurdles that we’re pleased to have behind us. We had a rounded bolt on the clutch assembly that caused a delay first thing. The clutch doesn’t look new but is certainly serviceable so despite the potential for saving labour later by changing the clutch now, Ben has decided not to; we don’t even know that this engine swap is going to work yet! 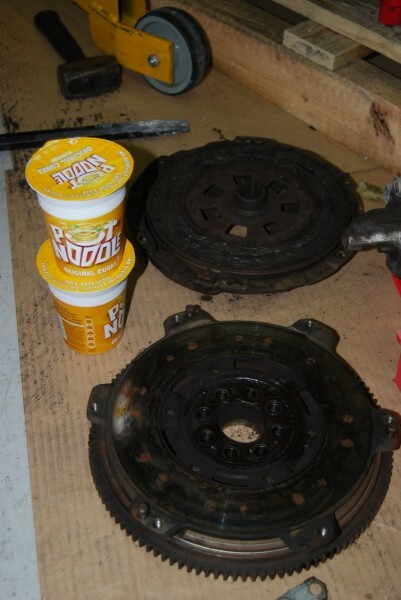 So, left is the clutch and flywheel assembly, photographed with a torque converter couple of pot noodles. 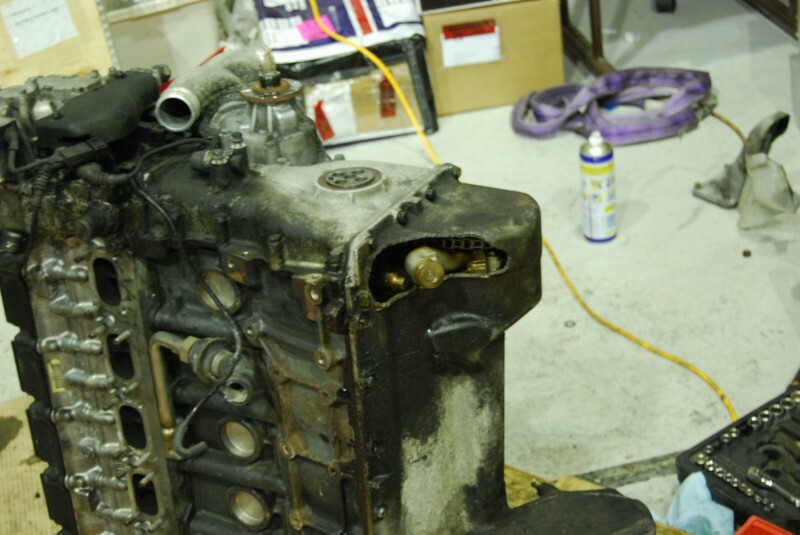 Ben set about stripping the remaining assets from the outgoing block: fuel feed, throttle bodies, ancillaries; until we reached the stage where both motors looked about the same. 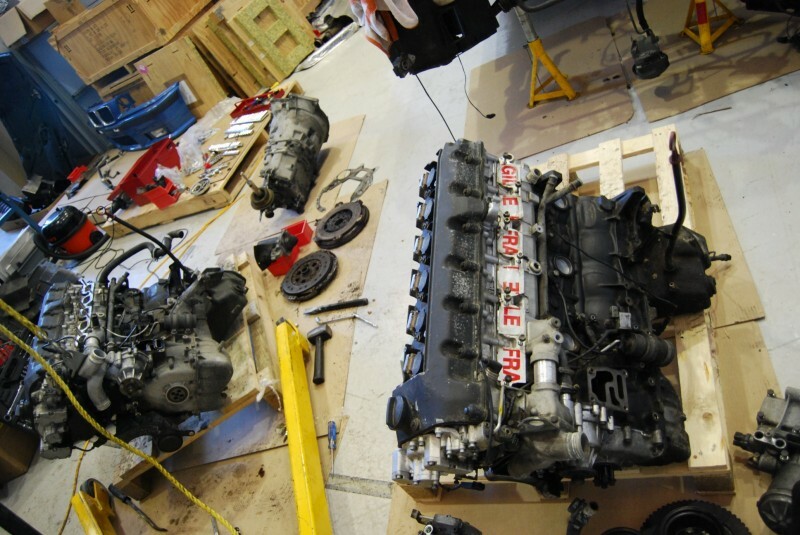 In the photo below the outgoing motor is on the left and the replacement is being prepared on the right. 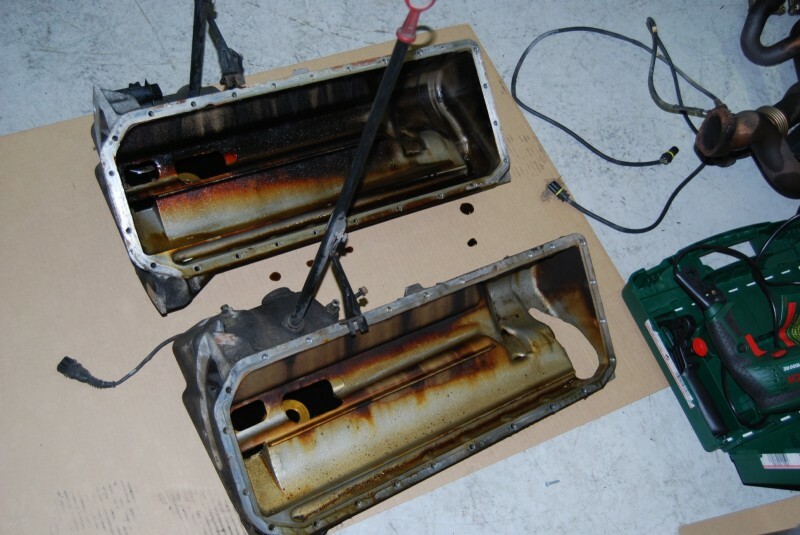 This was also an interesting step because it gave us the first chance to look inside the outgoing motor. 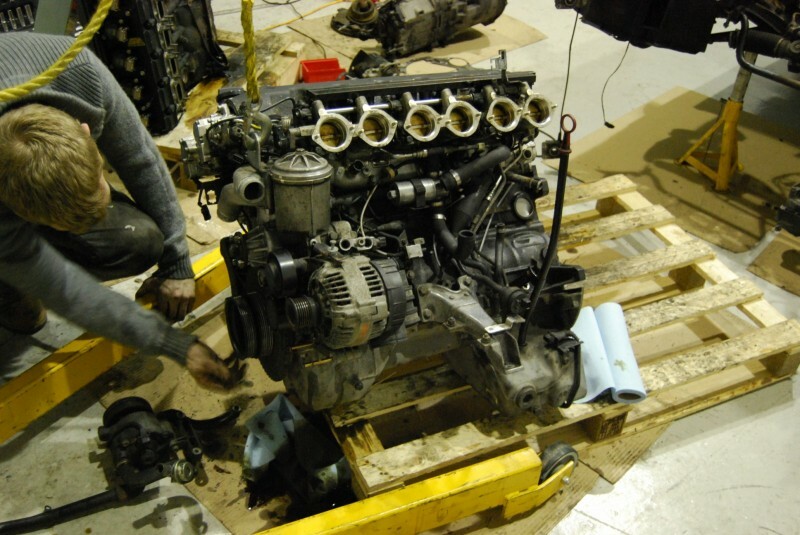 The whole reason for this process is that the old motor has developed an alarming knock which sounds decidedly bottom-endish. 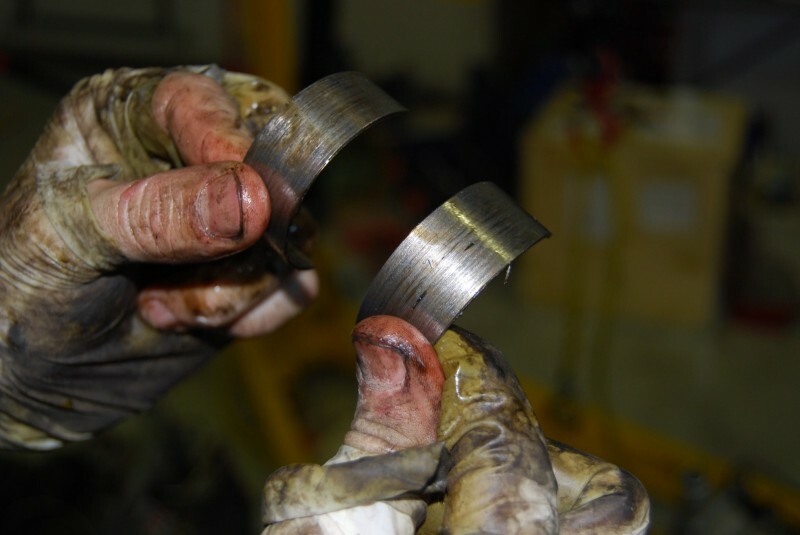 I’d heard that it was common for the bottom of piston 5 to slip on the crank, and lo and behold this seems to be exactly what’s happened. I’m annoyed that my SLR won’t take video because it’s so hard to describe the issue with stills, but in the picture below the bottom of piston 5 is pretty much in the middle. 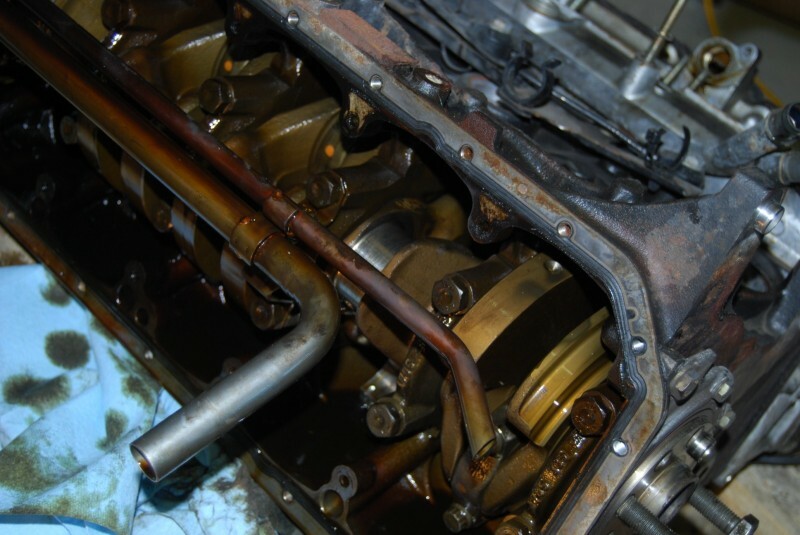 The gold casing – a U section clamp around the crank, could easily be wiggled vertically by hand in a manner that the other 11 (both engines!) couldn’t. Below are two items that I believe are referred to as ‘shells’; semi circular clasps that surround the point at which the con-rod meets the crank – a bearing like interface. They certainly looked worn, if not a bit damaged. Note the wonderful fingerless mechanic’s gloves Ben’s wearing there! 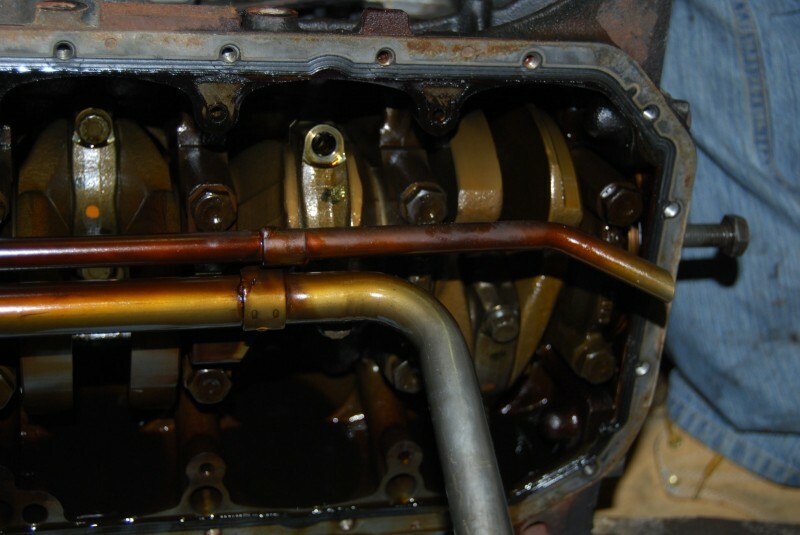 The photo below shows where the shells sit around the crank. Sumps swapped, it was time to reassemble the ‘new’ motor. Lots of cleaning has taken place! 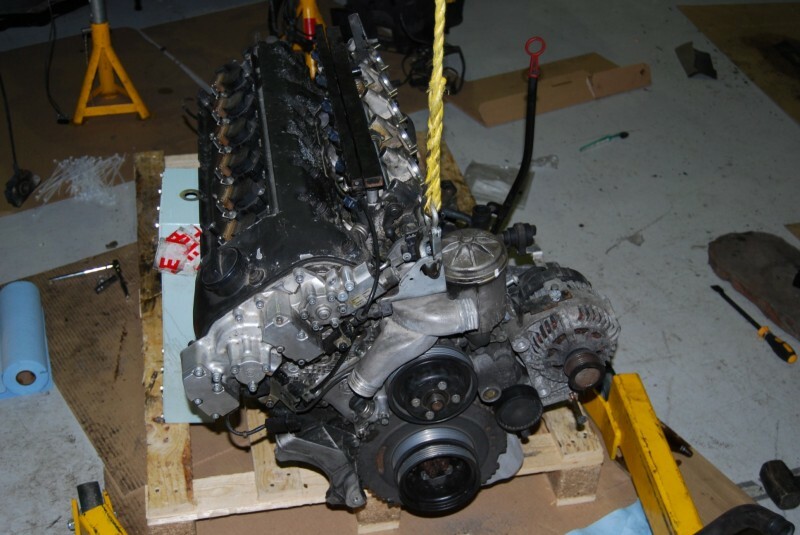 Above you can see the water pump, fuel rails and throttle bodies have found their way on. 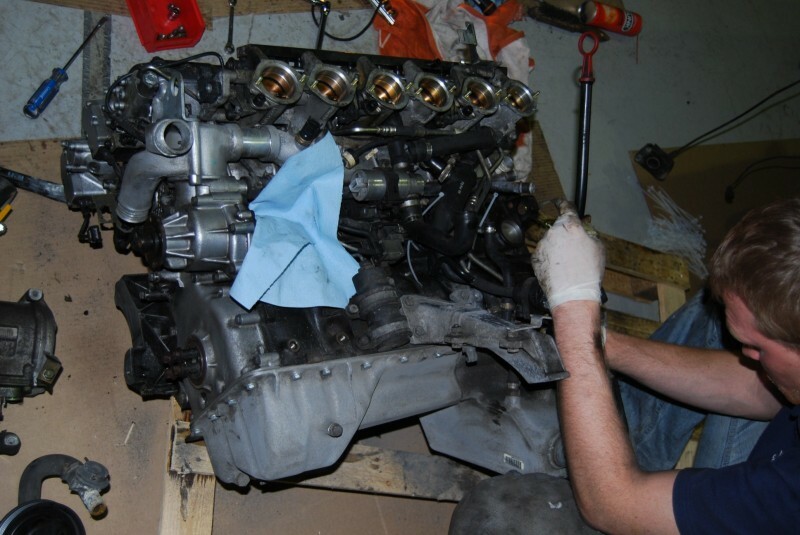 I also replaced all the VANOS bolts and VANOS filter in accordance with my article on the matter, and changed the oil filter and all associated seals and washers. I guess that’s a second oil pickup protruding from the sump there. 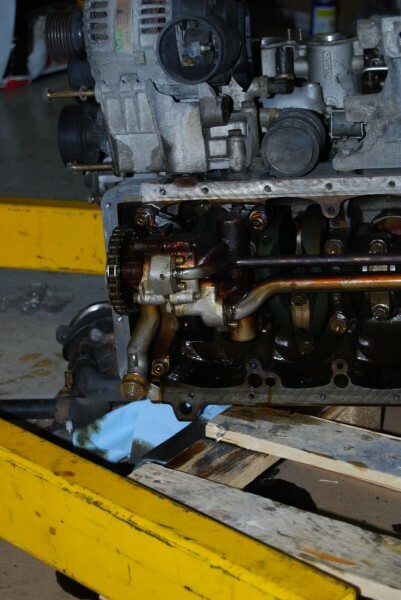 We removed the sump from the ‘new’ motor and found to our dismay that this part was indeed missing, and we could clearly see the oil pump assembly was broken where that arm had snapped off. 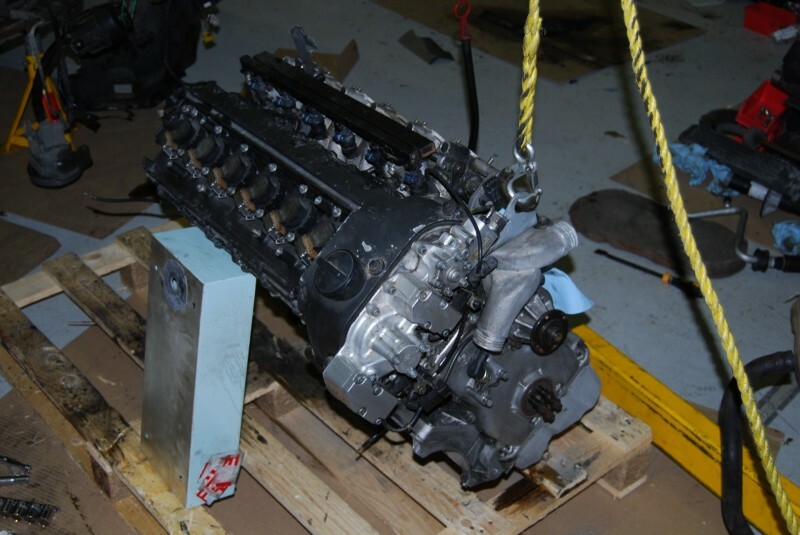 There was no other option – we had to remove the chain from the oil pump and swap the parts over. 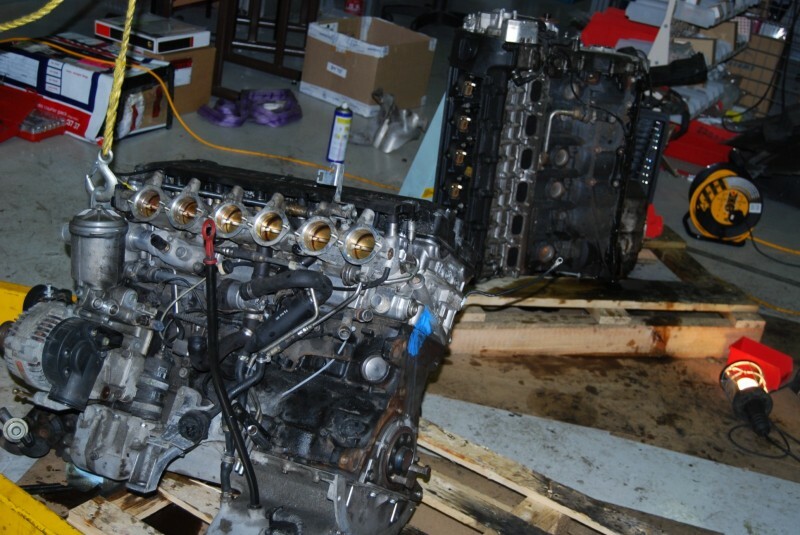 It all got a bit frantic at this stage so I omitted to photograph the oil pump assemblies out of the blocks, but to the left you can see the ‘new’ motor once we’d fitted the good parts from the outgoing engine. This done it was time to refit the sump, and here we had another setback – despite using a torque wrench @ 12Nm I snapped a sump bolt. This prompted the sump to once again be removed while I surgically removed the bolt from the block, and we then chose to run a tap through any sticky holes as a precaution. Again, loads more time lost here! Finally we’re in a position where most of the ancillaries are on the new block. 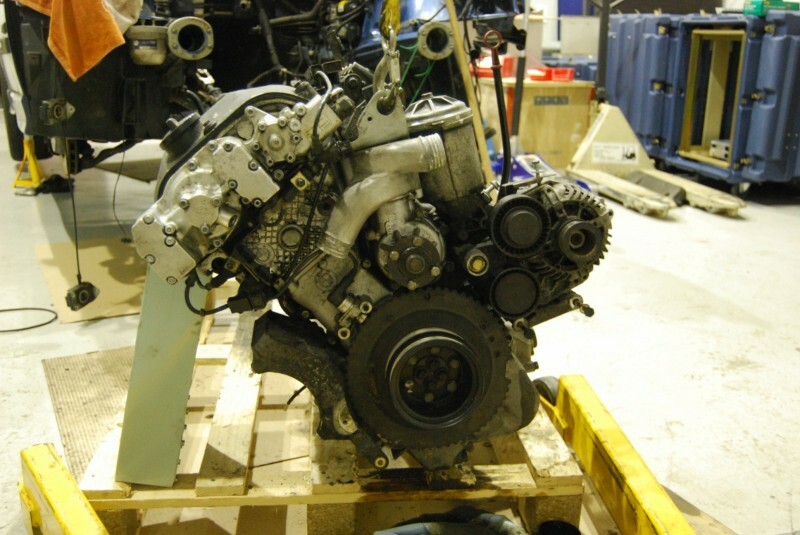 Tomorrow’s jobs are to get the gearbox and clutch assembly on the new engine, and generally prepare matters for the unit to be reunited with the car. Here’s how the block looks now – I can’t believe how much better it all looks for a good scrub!